The 351CM007 CAN module from Elobau (Germany) connects operator controls and sensors with digital or analog outputs to CAN systems. The CAN protocols CANopen and SAE J1939 are possible. 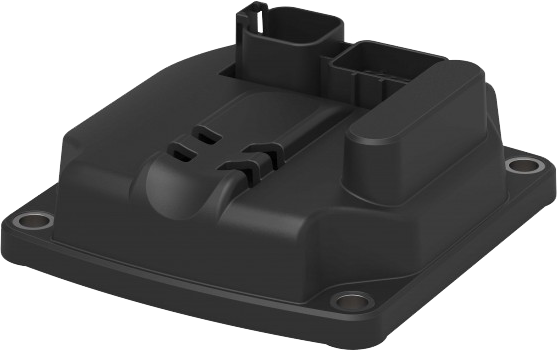 Initially designed for the company’s J4F joystick with safety electronics, the module is now available as a standalone solution to turn any standard joystick into a joystick with safety electronics. Designed for use in the extreme operating conditions of off-highway vehicles, the module has an IP67 protection class, and operates on either CANopen or SAE J1939 CAN protocols. Wiring the machine is simplified as all components and controls are connected, and communicate on one bus system, and if operating on SAE J1939 with safety functions, each component connected to the module can fulfill safety functions in accordance with SIL2 (EN 61505:2010), PLd (13849-1:2008). Although designed for installation in confined spaces, it doesn’t compromise on functionality, with 17 inputs for analog and digital signals, three LED outputs, and an additional 5-V supply available for external components. Constructed from glass fiber reinforced plastic, it is lightweight yet robust. The design contains openings for fixing cables to avoid unintentional damage, and mounting sleeves for mounting. The CAN modules are configured by the company for each application. The N5 tilt sensor by Elobau (Germany) comes with a CAN interface supporting CANopen and J1939.